'Miniature Ikebana' was the theme of our recent Sogetsu workshop run by Helen Quarrell. This theme has been recently introduced into the curriculum, officially, even though it had been introduced by Kasumi Teshigahara, the second Iemoto, a long time ago. It is a very enjoyable exercise, which appeals to most people. My mother, who has lived with me for more than a decade and has seen countless ikebana arrangements in my home, has never commented on any of them. But when I make miniatures she is absolutely delighted. Please go to Sogetsu Ikebana Victoria and click on 'Recent Workshops' for more members' photographs. The theme for last week's class was 'Glass Containers'. In this exercise the transparency of glass is an important feature. The materials can be displayed inside, outside or both in and out of the container. I've done this exercise many times before, including very recently when I demonstrated at MIFGS (arrangement to the left). So, I decided to work with this beautiful and colourful but rather difficult glass vase. It is difficult because there is enough detail inside the vase itself, that adding materials to it would be unattractive and messy. The challenge was to place materials in such a way that the stems would NOT be seen through the glass and to allow the colouful swirl to feature. At yesterday's Ikebana International meeting we enjoyed a demonstration in a basket by Aiko Nakada, head of Ohara School Melbourne. Sadly this was Aiko-san's last demonstration as she is leaving us to return to Japan. We will miss her! Many beautiful arrangements in equally beautiful baskets were made by members and, I'm sure, Christopher will post photographs on the II blog in due course. Please go to II Melbourne. Usually baskets are light and require light materials to make a successful arrangement. Being very short of time, I was unable to find enough light materials to use in a conventional basket, so I chose to go a different way. I used the woven box with lid, below, with amaranthus, dahlias and crab apples. I leave you with this last arrangement, for which I re-used two bromeliads from my exhibit at MIFGS. I couldn't bear to throw them away, thus the creation of the arrangement, below. It is interesting to note that despite the fact that the bromeliads do not reach the water, they look fresh and vibrant. My goodness, it's been an unbelievably busy time, ikebana-wise and I am utterly worn out. I've exhibited at the Melbourne International Flower and Garden Show (MIFGS) eleven times so far and, each time, I try to come up with something I haven't done before. There's a great deal of work involved and I had intended to give it a miss this year, however, my cousin Nick offered me a large perspex dome because he didn't know what to do with it and, of course, I jumped at the offer. I knew I would use it at MIFGS and it wasn't long before I came up with the idea of depicting a post apocalyptic scene, with vibrant life under the dome but devastation all around. This was a very conceptual work and not at all Ikebana but I wanted to make an environmental statement. Sadly, the dome was very reflective, making it difficult to photograph, so at the end of the show, I took a photo of the interior without the dome. On the right hand side I had a running waterfall over rocks into a pond but, again, it didn't photograph well. At the same time, our Ikebana International Melbourne Chapter is celebrating its 60th anniversary with many events planned. Firstly, we had the privilege of the Iemoto (Head of School) of Ichiyo School, visiting us and making a large display at MIFGS with displays by the other four schools on either side. The exhibit was awarded a bronze medal. The theme was 'Green Bamboo and Autumn'. Below are the photographs of the exhibits taken separately because it was impossible to photograph the whole display due to its size. A luncheon was organised for our members with a demonstration by the Iemoto last Thursday. Mr Naohiro Kasuya chose the column in the centre of the room, around which he created an installation without the use of mechanics such as wire screws etc. The table arrangements for the luncheon were made by volunteer members and I was one of them. An oval shaped ceramic bowl was given to each of us and we were asked to make a table arrangement that would, then, be won by one of the guests at each table. There were many considerations for making this arrangement - it had to be low so as not to obstruct the guests' view of each other, it was to be viewed from all sides, it had to be without a kenzan and it had to be portable - both by us to the venue and by the winners to take home. Below are two views of my arrangement. I used green bamboo to create a structure that could stand independently over the bowl, onto which I wired the swan flowers and aspidistra leaves. The winner seemed very pleased. Last Saturday, Mr Kasuya conducted a workshop on the theme 'No Kenzan' arrangement in a suiban, in the Ichiyo school style. We have the same theme in the Sogetsu school but the principles are very different. I found it a very interesting and learning experience. We all had four stems of tortured willow to create a base in the suiban, which would support subsequent branches and/or flowers. Then we could choose a small bunch of foliage material and a small bunch of flowers. But wait again, there's even more! On Sunday, the last day of the show, members of the five different schools demonstrated on the main stage. I was the Sogetsu demonstrator with my trusty assistant, Lucy. We were the opening act. Julie Ireland, our tireless events coordinator, suggested we make one arrangement that non ikebana members of the audience could go home and make themselves. So, I chose a very simple glass vase, two mother-in-law tongues and a small tamarilo to show that we don't need a fancy container or expensive flowers to create something interesting. That's the first photograph, below. There were very bright screens behind the stage, which made taking good photographs impossible. Below are the best of a bad lot of me and Lucy demonstrating. On that Sunday evening we had to take down our exhibits. My poor, long suffering husband, Sam arrived with a borrowed ute to take everything back home. Carrying the dome to the Exhibition Buildings and then back home was a major challenge. It is 1.8 metres in diameter, making it too wide for the ute tray. Securing it took some effort and ingenuity but we did it and now it's sitting on my lawn. Anyone want to buy a large perspex dome? And last but by no means least, my grandson's basketball team won their championship on Saturday and Xavier was named 'Best Team Player'. Could Yiayia be any more proud? OK! I'm going to bed now. I'll write about class on my next post. Thank you for staying to the end. You may have noticed that this post is one week early. There's a good reason for that. I will be so busy next week that I will not have time for the blog. Some of you will already know that The Melbourne International Flower and Garden Show (MIFGS) will be on from Wednesday 27th March until Sunday 31st March. As with previous years, I will be taking part in the Baptcare Shop Window Competition. We have three days for setting up before the opening. On Sunday, the last day, at 11.30 there will be Ikebana demonstrations on the main stage by members of Ikebana International. I will be the Sogetsu demonstrator. 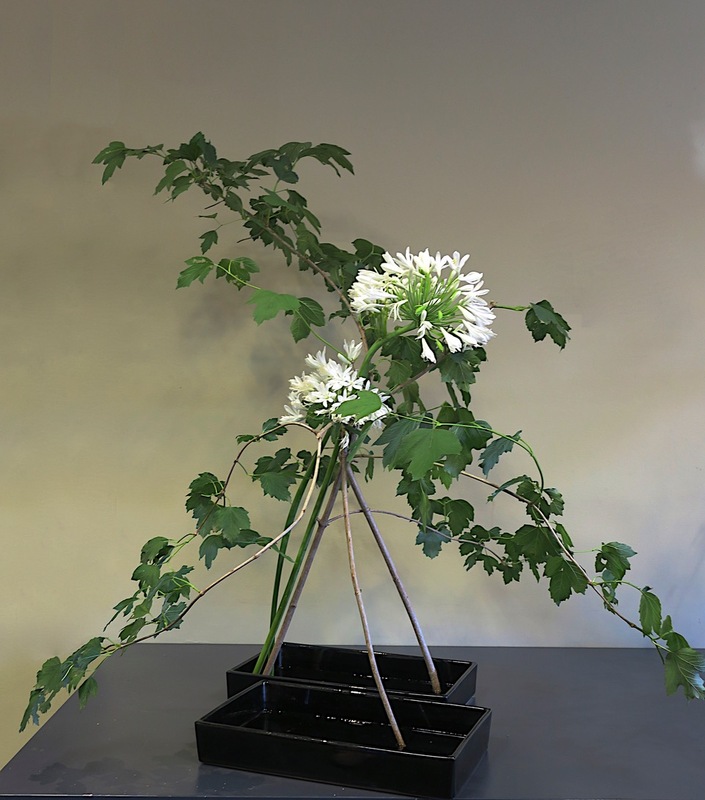 Ikebana will be very well represented in the Great Hall this year because the Iemoto (Head of School) of the Ichio School, Naohiro Kasuya, will be here to produce a very large display, with the assistance of II members. Last week the Ikebana International Melbourne Chapter celebrated its 60th Anniversary. The meeting was well attended and the delicious fruit cake made by Marj Campkin-Smith was enjoyed by all, especially me! I was particularly happy and grateful at that meeting because I was the first winner of the raffle making me the owner of the beautiful vase, above. It was a very generous donation by Joshua Longmore from Made In Japan. Like a child with a new toy, I couldn't wait to come home and 'play' with it. The curved agapanthus stems suited the shape of the container and the yellowing seed head picked up the colour of the rim of the container. The unobstructed, clear view of the water was particularly pleasing to me. For the meeting, my arrangement, above, began with the crucifix orchids, which were the only undamaged flowers in my garden. Their very thin stems meant that I could use them in this vase, which has a very small opening. I then looked around for accompanying material, settling on the spent sunflowers and taro leaves. For more photographs of the members' arrangements, click on II Melbourne. At our last class I had set the theme 'Composition Expressing a Movement'. I, also, used agave but in a very different way with one garlic flower. As I was looking through the agapanthus bed for materials, I came across two interestingly bent stems. Now, I often create the curves myself but in this case nature gets all the credit. As I held them and looked at them, the arrangement came to life. So, when putting them in this self-made container, I took some pains to make sure that the stems rose from the middle of the vase and did not lean against the edge. I was happy with the result. Later, as I walked passed it a few times, it seemed a tad too simple. I looked around for something suitable to add and found this old wisteria vine that was sprayed black. Personally, I still prefer the first version. You can decide which you like better. 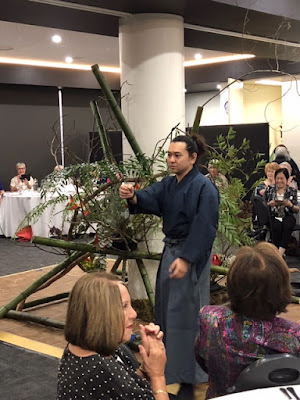 Last week I had the pleasure of introducing ikebana to the U3A Mornington Group as part of their "That was Then" 2019 history program. I had been contacted by Gus van der Heyde late last year and was asked to do this presentation. Of course I agreed and, when the time came, I 'dragged' the ever accommodating Lucy along as my assistant. We had a very pleasant morning demonstrating to a group that was appreciative, interested and engaged. It's quite different demonstrating to a group that knows nothing about ikebana or floral art. I needed to select appropriate arrangements that are varied in style, size, materials and containers. The difficulty that I faced was the scarcity of materials that had not been destroyed by the extremely hot weather we had experienced. It just meant that I had to be more creative with the materials I had. Below are photographs of the eight arrangements I did that morning. I had to dismantle the arrangements to bring them home and then re-arrange them in order to photograph them. My apologies to the attendees if there are slight differences from the original. It is almost impossible to recreate an arrangement exactly. It's been a busy time ikebana wise lately. We had our first Ikebana International meeting for the year and a week later, we had our Sogetsu Annual General Meeting and workshop. At the II meeting we enjoyed a talk on Sumi-e (ink brush painting) by Emi Kamataki, who is a very experienced practitioner of this ancient art form. Before Ms Katamaki's very informative talk, the members were asked to make an arrangement using the theme Japanese Art Work/Sumi-e. The first Japanese art work that came to mind for me was the giant yellow pumpkin on Naoshima island by Yoyoi Kusama. This is because I had recently seen the documentary about her life, 'Infinity'. Also I had visited Naoshima with Sam in 2014 and was quite impressed by this sculpture sitting on a jetty and greeting visitors as they approach the island. There was, also, an exhibit of hers at the NGV in 2017 called 'Flower Obsession'. I had taken the two older grandchildren to that, something we all enjoyed. For more photographs of the members' arrangements, please go to II Melbourne. After the Sogetsu Annual General meeting a workshop was conducted by Angeline Lo on the theme from book 4 and book 5 of an 'Arrangement without a kenzan'. This means that branches and other materials are to be arranged in a suiban (shallow dish) without the use of a kenzan. There's quite a degree of difficulty in balancing the materials whilst creating a pleasing arrangement. I used some large branches of viburnum opulus and agapanthus intending to make the 'legs' of the arrangement vertical but the side branches were too weak to hold the weight, so I ended up with this 'tee-pee' style instead. Not my favourite look. For class last week I set the theme from Book 4 - With Leaves Only because there are few flowers left in our gardens after the extreme temperatures that we have been experiencing. Coincidently, my colleague, Christopher, also set the same theme for his class. To get to Christopher's blog click on 'Roadside Ikebana' on the side of this page. Leaves can vary greatly in colour, texture, shape and size, so that it is not difficult to create a pleasing arrangement without adding flowers. For this exercise we use only individual leaves not leaves on a branch. Two or more different types of leaves should be used and thin leaves, such as dietes or spear grass are to be avoided as they are considered 'lines' in this context. My student Shaneen, who is working her way through Book 3, made this next arrangement - Composition of Curved Lines. I've really enjoyed using these garlic flowers, which, apart from being large and beautiful, they are very long lasting because they dry without changing appearance. In the arrangement, below, I have used the flowers from a previous arrangement I did in late December. They still look great two and a half months later.